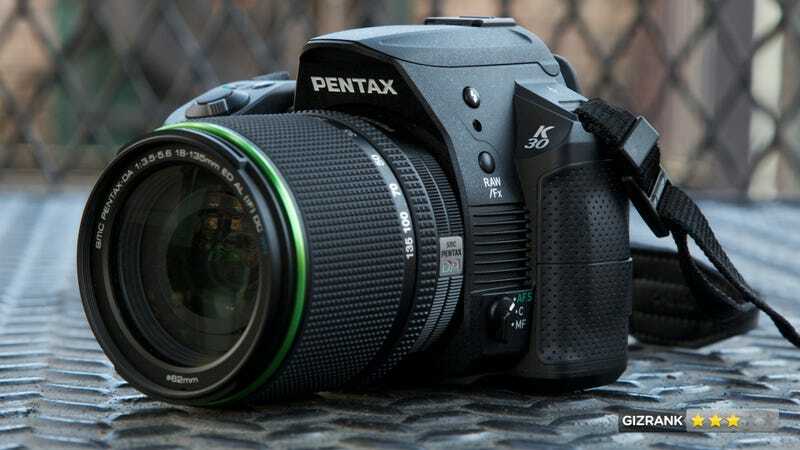 A DSLR camera in the $1,000 range isn't usually as quick and rugged Pentax K-30. That solid performance inside a well-built shell has had us excited since we first got our hands on its weather-sealed body. This camera is clearly the competitor to Canon's new T4i—can its photos and videos hold up? A tough, low-to-midrange DSLR with a 16.3-megapixel, APS-C sensor. Accident-prone beginner photographers looking for their first DSLR. Made of thick polycarbonate and rubber, with a deep grip and pop-up flash, the stocky K-30 is heavier than comparable DSLRs. Handles beautifully. Plenty of buttons and switches on the camera body adjust ISO, white balance, focus mode, and exposure compensation. Two adjustment dials—one for aperture, the other for shutter speed— make it easy to shoot in full-manual mode. Getting great photos out of this camera is easy. The HD video is a mess compared to the competition. It's easy to find the cheaper $900 kit, which comes with a non-weather resistant 18-55mm lens. Hunt around for the better $1200 package, which includes an 18-135mm lens. We got trapped in a brutal, soaking thunderstorm, and the K-30 survived. The camera's not just easy to use on the outside—its menus are refreshingly simple and well-designed. A dashboard behind the menu button lets you adjust every other shooting setting you could want to tweak. The optics on the more expensive telephoto lens are excellent. It zooms all the way to 135mm without noticeable distortion. It's also weather-resistant. Sadly, the bundle with this lens costs $200 more than the 18-55mm counterpart. The K-30's performance is impressive across the board. The autofocus system is fast and accurate even in darker conditions. The light metering is very smart and the camera does a great job calculating automatic exposures even in high-contrast situations. The shutter responds very fast—if loudly—and the 6 fps continuous shooting mode is the quickest in its class. For all the camera's excellent image quality, its video leaves us wanting more. The camera's image stabilization causes noticeable distortion and without stabilization, the video quality is unusable. The upside is that the camera can shoot video at higher ISOs with relatively low noise. This camera's image quality is impressive. It shot still photos beautifully. To get the most of out of it, you need to spring for the pricier glass—the cheap kit package looks attractive, but it's too limited. There's one other factor to consider—upcoming changes in the product category. If you're planning a purchase in this class of camera, wait on the reviews of the new Canon T4i, and the anticipated update to Nikon's two-year-old D7000, before buying anything. Once they arrive, it will be much clearer idea which entry-level DSLR is the best product—and which is the best deal.